Have you ever tried to get a username on an email service but it was unavailable and you ended up with some lame name with a bunch of numbers at the end? Yahoo though so and has setup a program where they are releasing a bunch of inactive usernames on their site so people who want to use these names can. There are a few problems with this but if you really want to use Yahoo mail or had an account that you don’t use much on Yahoo you should check this out. You can now enter up to five usernames to request and an existing email address and you may get the name in a month if you were the first to request it and then claim it. I would think they are also letting people who didn’t know that they were doing this to be able to reclaim usernames within this month if you haven’t logged in, in over a year. So get logging in and keep your names. 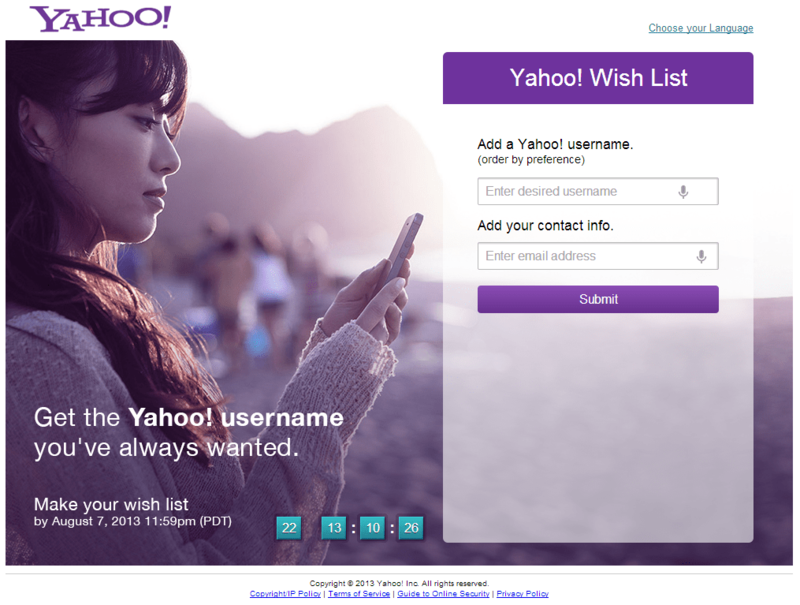 But if you want a new name go to wishlist.yahoo.com and put in some names to see if you can get something better. I did my name and my online name because I had to use an altered version of it even years ago when I signed up for a Yahoo account. One thing to think about this, if you use an old account that you haven’t logged into for over a year and this account is a backup for other services this may open you up to having password resets sent to other people or scammers. While Yahoo says they have a fix for this by looking at the headers, all that sounds like is a bunch of garbage, because the headers don’t have any information to identify that the old account user was asking for a reset and not the new user. My advice is to reactivate old accounts as soon as you can and log into all accounts on not only Yahoo but Hotmail, Google, AOL and others so you don’t lose your accounts. Then if you want a better name go to the wish list page and add some names and a current email address so you can try to get a name that is better for you. Also when you are looking at your accounts look for the backup email address and keep that to a current address that you check regularly so if you need to reset your password or scammer is trying to reset your account you will get notified and you can take steps to fix it. I think reusing usernames is nice but has major security problems along with an unfair action to people who may not use it all that much. Posted on July 16, 2013, in Archive, E-Mails, Websites, Yahoo! and tagged AOL, Email address, Facebook, Google, Hotmail, Login, Password, User, wish list, Yahoo, Yahoo Mail. Bookmark the permalink. Leave a Comment.